I recently received a bunch of cute little Persian cookie cutters from my in-laws, and wanted to put them in use. I wanted to make Persian chickpea cookies that requires roasted chickpea flour (the key is the roasted part), and there is only one place in Ottawa I knew to get it from. 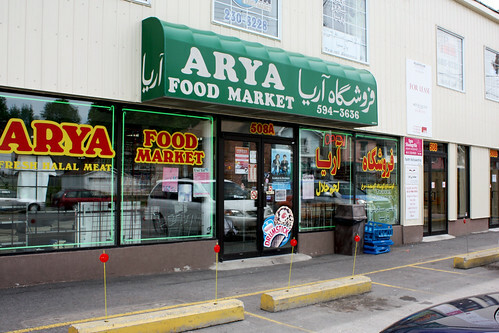 Arya Food Market is a Persian food store that sells Persian groceries, spices, and pastries. They also have a butcher in the back that offers halal meat. Aside from purchasing the roasted chickpea flower, I saw a bunch of lovely pastries that were just calling out my name. 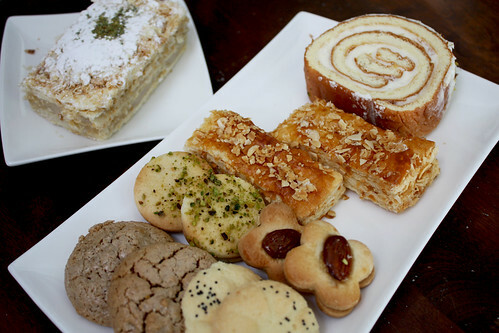 Arya gets their pastries mainly from Toronto, but they import pastries from Tehran as well. One of my favorite Persian desserts is the napelonee. 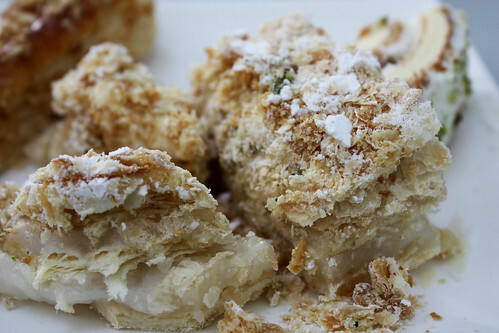 It is flaky pastry layered with egg white custard. Look at how easy it crumbles...so delicate. One of CK's childhood favorites is the rolette. 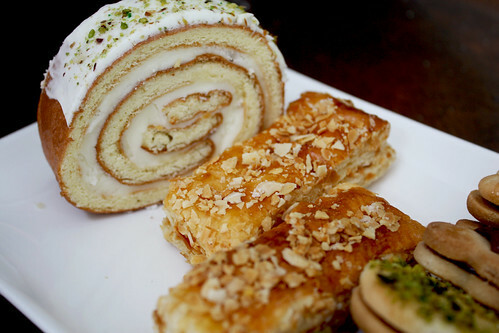 It is white cake rolled with cream, and topped with pistachios. There is a similar Chinese version of this dessert that I really like. Also pictured above were some plain pastries (nothing inside) brushed with syrup and topped with crushed almonds. They didn't have a lot taste, but are nice for a plain dessert. Another one of my favorites is the walnut cookie, or nan-gerdui. This cookie does not contain any flour and is made up mainly of ground walnuts and confectioners sugar. They are the brown cookies in the picture below. 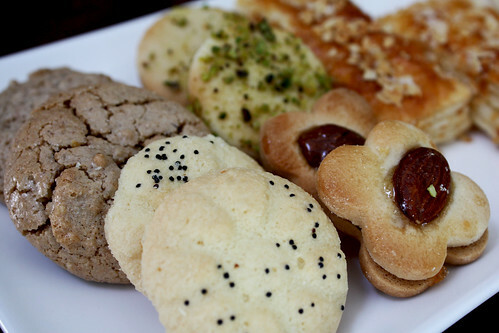 I also purchased some nan-berenji, Persian rice cookies. This cookie crumbles easily and is made of rice flour. They are normally topped with black poppy seeds. The last of the cookies were some butter cookies with a date paste in the middle. I'm not sure of the name of them, but the ones topped with whole almonds were very good. 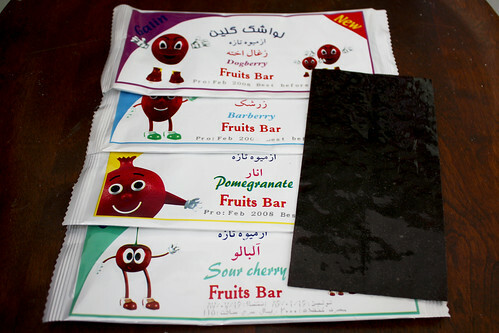 Aside from the pastries, I also picked up some Persian fruit leather, or lavashak. Lavashak is normally on the sour side, and very specific fruits are used such as sour cherry, plum, and pomegranate. A HUGE warning, make sure your lavashak is made of 100% pure fruit. I once picked up a yogurt curd flavored lavashak, and was not prepared for the taste at all. It is an acquired taste, and can be somewhat disgusting for someone who is not expecting it. The lavashak flavors I picked up were: dogberrry (My favorite because it is so sour), barberry, pomegranate, and sour cherry. They were all very good! Thanks for the yumi photos. 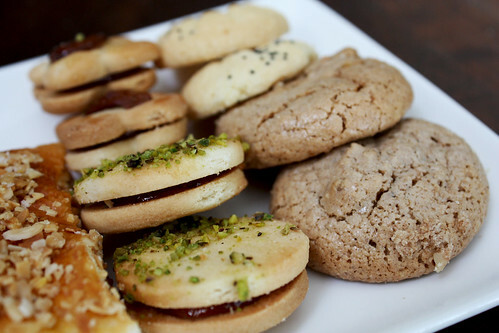 I need to know how to make the walnut cookies. I googooled it and found only two recpies for it and can I just say it didn't taste any thing like it :( Please help if you have any ideas :) thanks so so much.